Finished and ready for her new life in Southern Indiana. 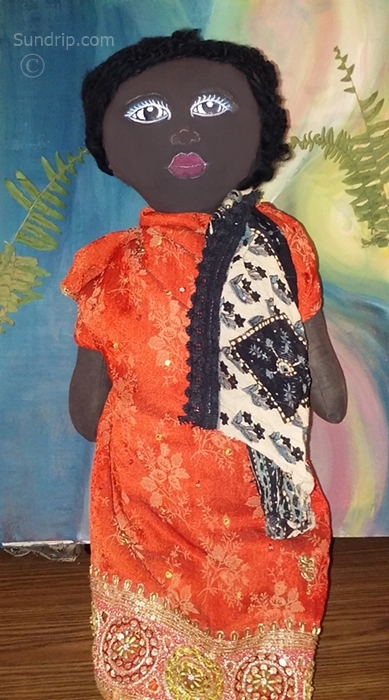 This is Rose Marie, a hand stitched, hand painted, ornamental rag doll. She's about 12 inches from head to toe and wears little white undies and little black shoes. Rose Marie is a doll that is soft to the touch and has very wavy brown hair made of super soft yarn. Her dress is made of up cycled material and detailed in gold and rose. She also wears a handmade pendant around the detailed collar of her dress. 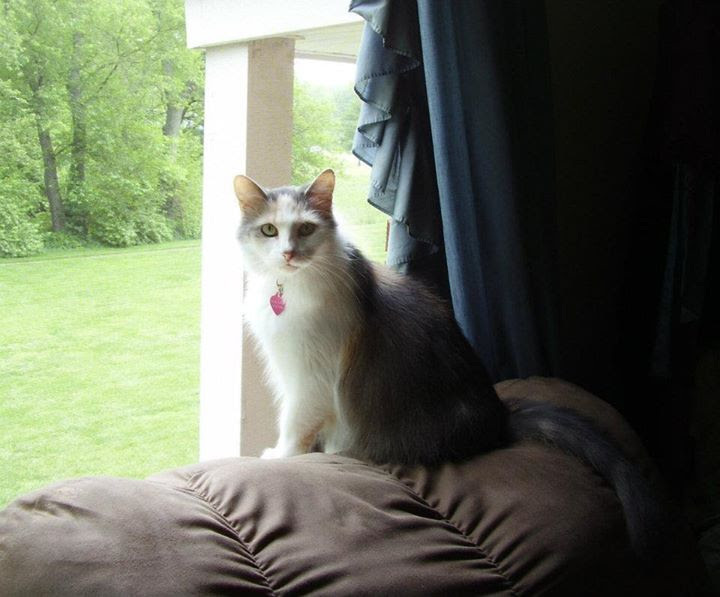 Rose Marie has a light scent of rose and sage which compliments her gentle nature. Wednesday she'll travel to her new home where she'll spend many happy days. Black folk art is some of my favorite art. It touches something in me deeply that is difficult to explain. This is a Black Raggedy Ann doll named Madison Ann. I can't say she's finished because I keep thinking I want to add one ribbon to her hair. I know someone else who has done a ton of whimsical dolls so I'll have to ask her expert advice. Madison Ann is about 18 inches. 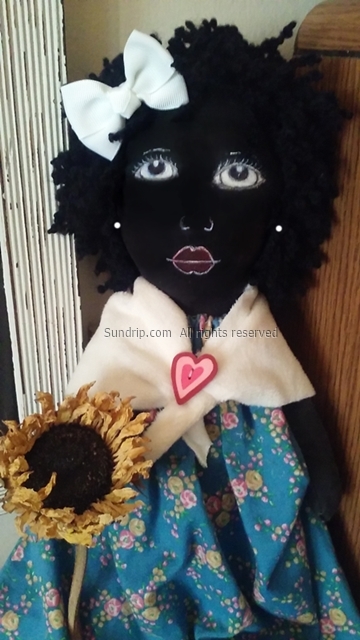 Like other handmade dolls on Sundrip, she is hand painted and has soft yarn hair. I search yarn shops looking for hair that is unique, something that will compliment the character of dolls made. 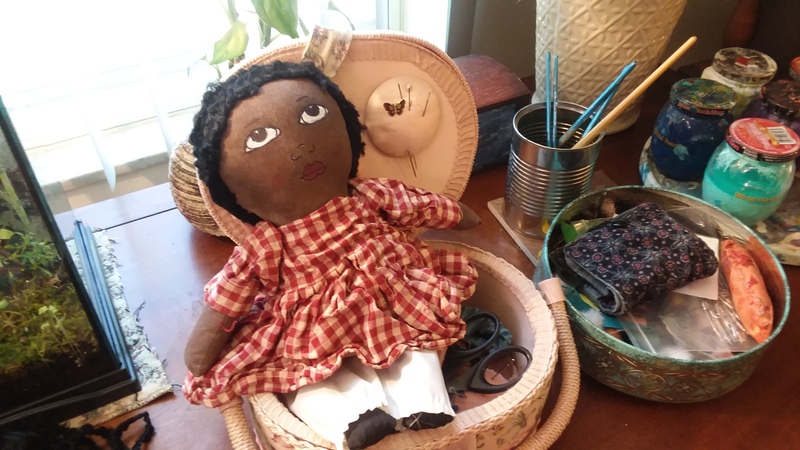 In this case, the yarn is intended for scarf making but when I saw it I had to use it for a black folk art doll. 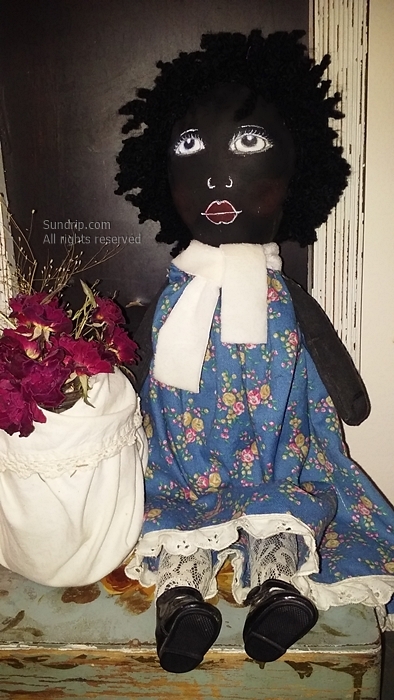 ...continue reading "Black Raggedy Ann Doll"
The more I make these dolls, the more I pay attention to my own. I've had my doll for several years now. In that time she has gone from all but being hidden in my bedroom to now sitting in the living room with flowers and such around her. I've re-written this entry four times and have settled on the fact that it's choppy. 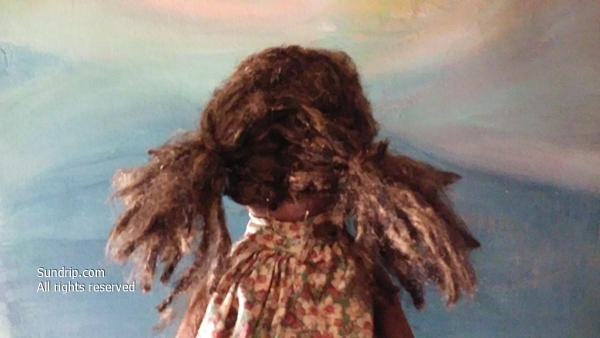 The entry is a collection of thoughts concerning my own inner child doll named Mia. I couldn't look at her for long periods of time and I didn't look in her eyes. I felt anger toward her. I hurt for her. I couldn't touch her. It felt like if I touched her I would have this lightening shock between me and her and I'd have to feel everything from childhood and adulthood all in one moment. I felt like I'd be gripped by flashbacks and never stop crying, never stop feeling the flashbacks on my body. Ah, it's time to start really thinning things out at home. I've tackled one corner of my room that has been bugging me for a good long time. It's the space where I hold all my old art journals and writing journals. A person can only have so much art before it starts to come out of places it shouldn't, so I'm cleaning out the studio. Here's what I'm doing, as much as it hurts to do so, some complete art journals are being tossed out while some are being kept. Some that are being thrown away have drawings taken out of them that I'll keep. As far as the journals that are being kept, they're being stored in a waterproof and air tight container. The individual pieces are stored in a filing system thingamabob. In a day or two I will start scanning the individual pieces then put them up on Etsy. 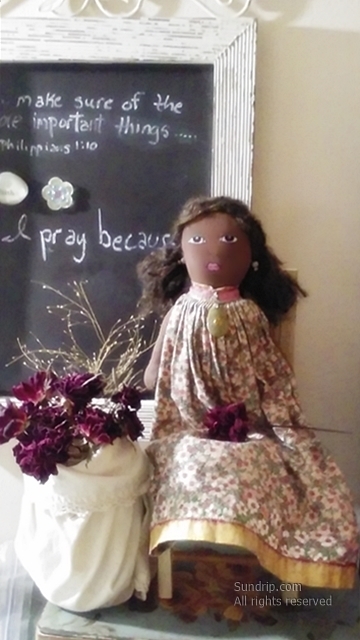 ...continue reading "Making Room for More"
African American Art Doll. African Inspired Custom Order. 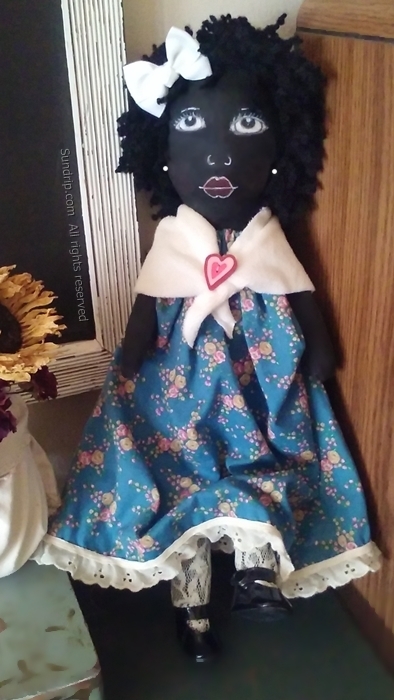 Author FaithPublished on May 9, 2016 May 9, 2016 Leave a comment on African American Art Doll. African Inspired Custom Order. I remember saying I wasn't going to do dolls anymore. I just couldn't get into it the way I was. Something interesting happened though, a woman who purchased a doll from me in 2009 contacted me to ask if I still make dolls. She wanted the doll to look a certain way. At first I was nervous because I thought, how am I going to make a doll when my head is a total mess and my body is running on the fumes of fumes. Still, I said yes. I'm happy I did. I really needed to remember that I can still make a quality doll. I was concerned about making her without a down payment because a few doll sales fell through. I was a bit cautious but with a down payment in hand I went ahead and made her doll. Just like before, no pattern was used. I used my machine to sew the main parts of the lower body. The head was sewn by hand. She is painted from head to toe by hand. Her face is hand drawn and painted. Her hair is two different types of yarn that give it a nice dark texture. 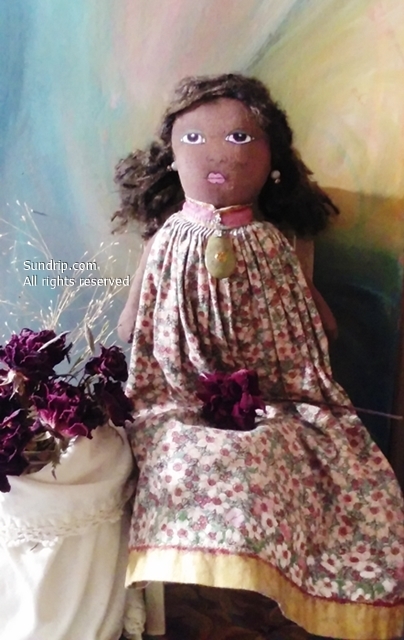 ...continue reading "African American Art Doll. African Inspired Custom Order." Published on May 9, 2016 May 9, 2016 Categories African-American Rag Doll, Originals, Rag DollTags Americana, Ethnic Art, Folk Art, Therapy dollsLeave a comment on African American Art Doll. African Inspired Custom Order. I hate doing this. I really do, however, I have a need I can't meet. I'm in need of a wheelchair...soon. I stare at that sentence in disbelief. I need a wheelchair. Wow! I didn't anticipate this for another 3 year or so but ... ya know. Although my insurance is good about paying for things, they will not pay for the wheelchair because they only pay for one ambulatory item every five years. They purchased a cane. I have some money for it because I had an Etsy sale but I don't have the entire $125 needed. A chair for that amount sounds insane, I know, but it's true. Just check out Walmart.com and punch in "wheelchair". You'll see they sell for other companies. The chairs aren't Walmart products but are from their affiliates. Anyway, I have added a donation button to the sidebar. This is the very first item I am offering for the new year which really makes me smile. Back to Priscilla. She is approximately 15 inches and has been hand painted and heat sealed three times. Her shoes are hand painted and sealed as well. Miss Priscilla's dress is made of red, white and brown checked material. It's not a bright red. I don't know the names of these fabrics but I can tell you it used to be a skirt purchased for it's material 🙂 It is the perfect look for a folk doll. Her little scarf is olive green with a tiny little gold dot to match the gold edges. (Please note: there is a gold dot spill on the scarf. It would have been worse had I attempted to correct it. I left it.) Priscilla is wearing tiny little white undies. Her short, simple hair is made of soft, textured yarn that resembles African American hair. As with many of my dolls I've given her a soft red glow on her cheeks, blue above her eyes and sweet lips. 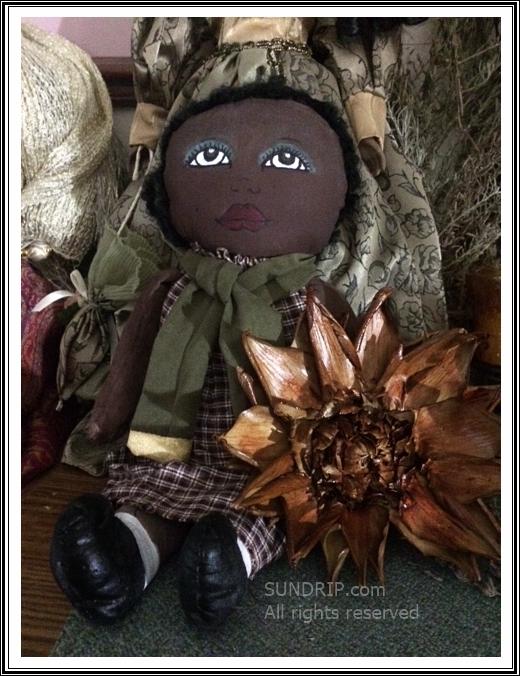 ...continue reading "Priscilla Handmade African American Rag Doll and Sunflower"